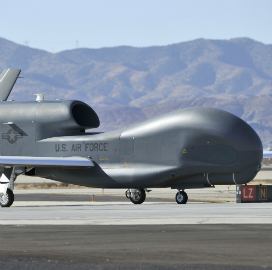 Northrop Grumman has marked the start of component parts production with Korea Jig and Fixtures and Firstec for South Korea’s RQ-4 Global Hawk unmanned aerial systems. Firstec displayed its wire harnesses and KJF showed its aerospace-grade machine parts for the UAS at the Seoul International Aerospace and Defense Exhibition, Northrop said Thursday. Northrop works with Firstec and KJF to produce component parts for integration with four Global Hawk drones that South Korea purchased through a foreign military sales contract it signed with the U.S. government in December 2014. “We seek to strengthen and develop the future economy of Korea by leveraging local industrial talent and resources in ways that build a more capable, competitive supply chain,” said Mick Jaggers, vice president and Global Hawk program manager at Northrop Grumman Aerospace Systems. Northrop has begun initial production on Korea’s first UAS at its facility in Mississippi and will carry out final assembly work on the aircraft in Palmdale, California. Global Hawk has recorded at least 150,000 flight hours to date and has been used in disaster relief, humanitarian assistance, counterterrorism, surveillance and combat operations, according to the company.